Now that I am an official resident of Brooklyn, I feel like I should give a big, Brooklyn-Style middle finger to the Atlantic Yards. I hadn't always felt that way. 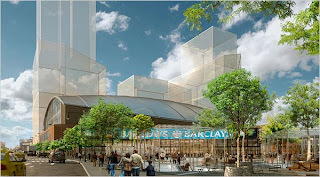 In fact, I had such high hopes when I learned that Frank Gehry had been brought on to design the sports complex and towers which would eventually be the new home of the New Jersey Nets. About six years ago, Bruce Ratner (CEO of the developer of the project: Forest City Ratner), bought the New Jersey Nets and pledged to transplant the NBA team to Brooklyn. But, there was a catch. Ratner wanted to use the Nets as leverage to gain the rights to a parcel of land owned by the transportation authority. In addition, it has been said that Forest City Ratner planned to kick out more than 1,000 middle-class families from surrounding apartment buildings which were to be replaced by new towers. These towers and sports arena were, in my opinion, going to be made architecturally tolerable by the fact that they were to be designed by Frank Gehry, who is as some say, the Frank Lloyd Wright of our time. The picture at left is a rendering from a 2006 plan for the yards, which included the new sports arena. 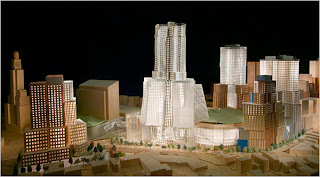 Late last week, Forest City Ratner confirmed the rumor that had been swirling for quite some time now: Frank Gehry is off the project. Instead, they have chosen a more "cost effective" (read: cheap) architect who is going to build what some officials call a modified "airplane hanger". The picture at right is a rendering of the new hanger. Really? Seriously? COME ON! The least you could do is make the place look architecturally interesting. But instead, it appears that we are now going to have a sports arena that is about as architecturally interesting as a WalMart. I guess there is a silver lining: it will match that crapstastic looking "shopping mall" that is right across the street.